A confession: on a recent road trip in northern Spain, my traveling companion asked if I would like to stop for the evening in the country of Andorra. My response: “Andorra? A country? Where?” You can attribute my ignorance to poor geography training, but also to the ability of Andorrans to slip under the radar and maintain a gorgeous little outpost of natural beauty and duty-free shopping in the shadow of the Pyrenees. A country of just 468 square kilometers (or about 2.5 times the size of Washington, D.C.) nestled between Spain and France, the Principality of Andorra was transformed into a parliamentary democracy as recently as 1993. For over 700 years, Andorrans lived under a kind of feudal system with two princes (one French, one Spanish) as heads of state. The heads of state have remained since the political transition in the early 1990s, though with much reduced powers. Neutral in both world wars, Andorra was largely impoverished until the 1950s, when tourism and duty-free shopping brought enormous wealth to the country. Today millions of visitors a year, mostly French and Spanish, flock to Andorra for the skiing, hiking, and luxury goods shopping. An unadventurous visitor could be forgiven for thinking that Andorra la Vella, the principality’s capital and largest town, consists of a single long road lined with electronics and luxury goods stores. You could even mistake the bustling avenue teeming with shops selling Swiss watches, Cuban cigars, and leather goods for a street in Hong Kong if the Pyrenees didn’t loom over the narrow valley in which the town rests. A little walking around town will assure any visitor that Andorra la Vella is much more than a collection of shops. The Old Quarter of town is full of charming old buildings and narrow cobblestone streets. The town’s annual festival, when locals gather for music, street theater, dancing, and feasting, begins the first weekend of each August. 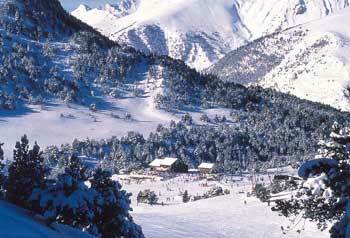 Andorra takes full advantage of its mountainous terrain, boasting the largest skiable area in the Pyrenees. December to March is the prime season for skiing and snowboarding, though many resorts produce man-made snow for continued use of popular slopes well into spring. In the spring and summer, when winter sports are at a low ebb, mountain biking, rock climbing, and horseback riding are popular alternatives. There are walking routes available for any taste, from relatively easy strolls through woodlands to intensive mountain hikes in the backcountry. Trout fishing in the high mountain rivers and lakes takes determination, as many of the best spots require long walks from nearby roads, but the rewards are great. Trout are plentiful, the water is crystal clear, while shopping traffic and bustling ski resorts seem a million miles away. Fishing licenses are available from tourism offices and fishing equipment shops. The seven parishes of Andorra, each consisting of several small towns and villages, boast varied scenery and activities, and can seem to be tiny worlds unto themselves. Each village has its own annual festival, most between July and September, and a trip to Andorra will benefit from the inclusion of one of these celebrations. Other festivals during the year include Sant Joan, the celebration of the summer solstice, and traditional fairs around Easter and Christmas. Andorra la Vella also lays claim to the world’s only International Women’s Clown Festival, held in May for the past few years. Visitors can travel to Andorra by plane, train, and bus from major cities in both Spain and France. The official language is Catalan.